Winsome readers: As promised, today is the day for my sneaky little give away. And boy am I glad. Today is one of those days, that even had I woken up at 3 AM (which I considered), it wouldn't have been early enough to get everything done. I wish I could form a committee to attend my meetings, unload my dishwasher, instruct my charges, return my phonecalls, grade my papers, plan my lessons, fill in my crossword puzzle, sew my Halloween costumes, mop my floors. The only thing I don't want any help with is my blog. I'll wake up early and stay up late and leave the laundry in heaps and be late for meetings for Prudence Pennywise. I suppose that means that I love it. I do. I love it. Thanks to my many readers for making it worthwhile for me to cook and write and gush on an almost daily basis. Thanks for your comments, emails, for spreading the word about Prudence Pennywise, and most especially your readership. I promise to never run out of money saving tips and recipes, as long as you promise to keep coming back. Deal? As for the give-away, leave a comment telling me your favorite fall food. That's it. If you feel so inclined, you can tell your friends to enter the give-away also. You've got till Friday, September 19, 2008 5:00 PST. I'll ship anywhere. A modern slow cooker recipe book. 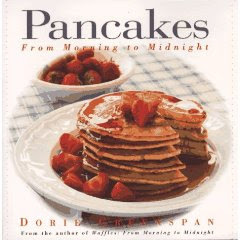 And I want this one also, because pancakes just sound fabulous on a fall morning. And this one I have, but it's so wonderful that I have to give it away again. 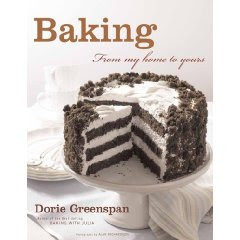 If I could only have one baking book, this would be it. Period. Well I think I need to pick a dessert and a main dish because it would be too hard to pick from both. Stew for dinner and apple pie for dessert. Keep blogging because we love to read! Ooh, that's a tough one, since I love fall so much. I love apple pie (with crumb topping, not top crust), but I'm really picky about it and don't like most store-bought. And anything pumpkin except pumpkin pie (not a fan of custardy things). My fall food is caramel apples! Yum! I would have to say the sourdough bread sandwiches with maple mustard and ham, sharp cheddar, and apple slices- although i usually do them with tomato instead- given the idea from some fall recipes of yours-PS I LOVE this blog- it has changed my culinary life for the good!! !Thank you!! I love a good homemade chili in the fall! Soup! Cooler weather screams out to me for any kind of soup. Soup and anything pumpkin....pumpkin bread, pumpkin cookies, pumpkin rolls, etc. You mean I have to pick one? I think Brunswick stew is one of my favorites. My favorite fall food is apples. Apple pie, apple cake, baked apples, all favs of mine. Yum! Can't decide between pumpkin anything (soup, cookies, bread, pie), apple anything (with meat, in a pie, anywhere!) and any kind of soup with a really good grilled cheese sandwich. A friend of yours, Anna (Nibley) Baker directed me to your blog and I'm so enjoying it. I've already passed it on to many family and friends. What fun! Of course we will keep coming back! I just adore your blog and you! I love apple crisp and my dad's apple cake! Really anything with apples:) Great giveaway. Thanks! I am so looking forward to curried butternut squash soup. I like to mix in a few spoonfuls of apple butter for sweetness. Yum!!! I have to say my favorite fall foods are chili's and soups and warm breads... hmmmmm.... love those! Its so funny that you mention favorite fall food. I just asked What is Autumn?" on my cupcake blog b/c I live in CA and we have no seasons but I needed ideas for an autumn inspired event. One of comments that stuck out was apples. I love caramel apples. Yum! 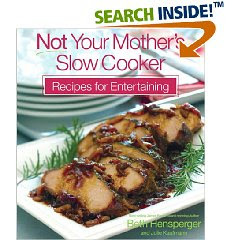 Hope I win the slow cooker book. I've been itching to use mine more... Thanks for the fun giveaway! Potatoe cream cheese soup with warm apple crisp for dessert and of coarse the carmel apples for the kids to make. Mmmm...my favorite fall food is pumpkin bars, any kind of pumpkin bars. Yum! So simple. Apples. A great apple is divine. Oh this time of year I CRAVE pumpkin. Pumpkin chocolate chip cookies, pumpkin chocolate chip bread, pumpkin crunch, pumpkin brownies, pumpkin pie. Yes, pretty much any pumpkin dessert! And soups. This is when I start scrolling through the soup section of my cookbook. I love beef stew with baking powder biscuits and pumpkin pie. I never had apple pie until I was over 40 years old - can you believe it? Please feel free to post my Port. bread recipe, and if you try any of my others, I'd be delighted to see them here, too! I know I am going to sound like a kiss-up but, my favorite fall food is your roasted pepper soup. I would eat it hot, cold or in between. I would eat it for breakfast, lunch or dinner. I would eat it everyday.The smell alone is enough to send me somewhere, I don't even know what I am saying but, I love it!!!! Does it count if it is a new favorite? Mmm...chili is my all time favorite fall food. Fall is the time for comfort foods, as we store up for winter...so that would mean stuff like warm sausage bread, or pumpkin pie cake....so good. Oh Prudy, this is hard...how to narrow down my favorites. I guess I will go with warm pumpkin bread with a little cream cheese on top! For our wedding I baked some 60 loaves of pumpkin bread (married in Nov)to give to our overnight guests. Great blog, I enjoy reading every day. My fav is pumpkin cake with whipped cream frosting! I think that my favorite fall food would have to be, pumpkin bread pudding, or a deep dish caramel apple pie with a crumb topping! Oh Prudy. Making me choose just one "favorite fall food" is like making me choose just one favorite Prudence Pennywise post. I guess it's possible, but it hurts my head to do it. When I think about Fall, my mouth waters for soups and hearty stews. It’s still hot in Texas, but as soon as the weather changes (towards the end of October) I’m making my favorite Taco Soup in a crock pot, followed by homemade tomato basil soup. I can’t wait. I love this giveaway too, thanks so much! My favorite fall food is probably my moms yummy chicken noodle soup! I wish I didn't live so far away! Its just not the same when I make it myself. My favorite fall recipe is soups! My mom always made the best soups. Now I am slowly learning how to make them on my own. Mmm, pumpkin cake donuts. YUM!. The ingredients I look forward to the most for fall are squash, sweet potatoes, and apples. The dish? Maybe a nice, warm, flaky chicken pot pie. hands down.....apple rhubarb crisp (ala mode of course)! When I think of fall foods I think of root vegetables and squash, things that are fall colors and that are warm, inviting, and hands on. An acorn squash, caramelised red onion, and apple gallette with a creamy cheese like sitlton or even goat cheese. Something that utilizes vegetables sounds good on a cool day and says warmth and comfort. Especially with a good crispy crust. You just can't beat that! You're like Superwoman1 I don't know how you do it all. Favorite fall foods: butternut squash in any form, big bowls of pasta, and soups! Soups, Chili and pumpkin anything, you know, bread, pie, roasted seeds, and soup. I guess there isn't one fall favorite. Just lots of good eats but what would make everything taste better is some COOL WEATHER!!! Good Luck with your mountain of obligations! You just need another you! I love anything apple or pumpkin, but I think that apple pie and pumpkin roll top the list. It is hard to choose but I think right now it is tortilla soup. Yum! My favorite food for the fall would have to be stew....or pumpkin pie! I love pot pies in the fall. Its a time that my sister and I spend time together- making several pot pies for our families. Another food challenge. . just ONE favorite? There is so much food that I just love. I guess I would have to say a good bowl of chili with a warm apple pie for dessert. My DH and I eat this every Halloween night as a tradition so it holds a special place in my heart! I love to make a stew filled with yummy squash, potatoes, corn, carrots and mushrooms. YUMMY. I also love making pumpkin custard. Those are my "go-to's" in the winter and fall. How have I never seen your blog before!! What a fun blog. My favorite fall food is well, let's see...hard to say, but I love gingerbread it always makes me think of fall (I even blogged about it the other day). It seems we are all thinking Fall!!! Oooooh, I want to enter your sneaky little giveaway! I am a TOTAL cookbook addict! It would have to be the stew I make every Halloween. YUMMY! It is a crock-pot recipe so it is perfect for the busy day. And it is easy! My kids LOVE it and it fills their bellies with hot food before they go out in the cold begging for candy! I'm glad you work hard on blogging. Trust me, we appreciate it! I did forget to add the barley. I was typing it up at 5 a.m. when Bitty decided to tinkle on my carpet so I got distracted. It's a cup of barley and 2 cups of water to go with it. Also, I added a lot more chicken broth then the directions said. Be sure to check Wednesday's post! I did a candy animal's story I think Sailor will love. And my favorite fall food is pumpkin pancakes, pumpkin bread and cinnamon rolls. You ask difficult questions Prudy. I think my favorite fall food is your Vermont maple ham sandwiches, Mom's corn chowder, and cinnamon rolls to top it off. Comfort food....it's all about comfort food in the fall. Homemade mac n cheese, apple pie, and chili...yes, chili....I can't wait! Hands down, butternut squash. I bake it to death then add either parmasean cheese or brown sugar depending on my mood. yuuuummmy. I love everything about fall, but for food purposes, I have 2: #1 is Soup. I absolutely love soup! I love in the desert of Arizona and it is too hot to make and eat soup any earlier in the year. #2 is anything pumpkin themed. My husband and I love pumpkin bread, pie, cookies...even pumpkin beer! BRING ON FALL!!! I love Spiced Apple anything...cider, pie, you name it! I also love a good chili in the fall. Homemade bread in any form. I love it fresh out of the oven. I may not be an amazing cook, but I made a delicious Shepard's Pie just the other day, and it reminded me of how delicious it is when the wheather starts to cool. My mom used to make it for my sisters and me on crisp, cool days, and I now make it for my kids. There is something about the creamy mashed potatoes, wonderfully seasoned meat, fresh warm green beans, and that oh so tasty melted cheese-that has me screaming SHEPARD'S PIE IS MY FALL FAVORITE! homemade chicken noodle soup with warm bread has got to be my favorite fall food...then a yummy caramel apple for dessert!! I love it when it finally gets cold enough in Alabama for homemade chili. I love to use it as a topping for baked potatoes with cheese and sour cream. MMMMM. (But it still isn't quite cold enough yet, so I wait. Potato soup with grilled cheese sandwiches and apple crisp for dessert. Yummy! Maybe I'll make that this weekend. Fall is my favorite time of year to cook. I love roasting meats and veggies, making soups and stews and baking delicous goodies. I'd say my favorite fall food is beef stew because it reminds me of my childhood, I love smelling it all day while it cooks and it tastes amazing. My favorite fall food is soup - I can't wait until it starts to turn cold so I can start adding soup back into my dinner plans. Brown bag apple pie, potato cheese soup, Disneyalnd Fritters, Homemade doughnuts . . . Sorry, I couldn't pick just one. my favorite fall food has to be my grandmother's stew....it is so hearty and filling and great on a cold fall day! I think my favorite fall food is, pumpkin pancakes with homemade apple spice syrup. Mmmm. So good. I'm going to echo many of your comments here: just one is almost an impossible task. I guess I must, however: Dorothy Mae Brown's Apple Spice Cake. I always make this after we take the kids to the apple orchard every fall - ya need a lot of apple recipes with 4 little apple pickers working their hardest to outdo each other, but this is our favorite. I love taco soup and cinnamon rolls in the fall...just something about this makes my mouth water...oh yeah, and i love your blog...!! I have to say a nice hearty soup or stew with some crusty bread to soak up the remains at the bottom of the bowl. Yummmmmmm! What a fun give away! I love fall! I am excited about the cooler weather and making homemade soup and homemade bread! These are 2 of my favorites! love the blog-and the giveaways! Pumpkin pie, pumpkin bars, pumpkin muffins...I'm a fool for pumpkin! I have to tell you, Prudy, my 80-something year old grandmother loves to play her piano and sing songs from "her day"...I asked her if she could sing "If I Knew You Were coming..." and it was awesome! My kids love to hear it daily when I click on your blog, and it brought back a sweet memory for my grandma! Eggs benedict or cinnamon rolls. Not really fall food but we make both for brunch on days we all get together to watch college football. I would have to say corn chowder- yum! There is nothing better than a briskly cool day to work up an appetite and corn chowder with smoky bacon is the remedy! apple crisp. without a doubt, apple crisp has fall written all over it. Cool! After this wondeful giveaway i can only offer to go your crossword puzzle! It's the least I can do! Favourite fall food? Maybe roasted chestnuts that are sold in the street and served on newspapers cones. I can feel the apples coming into season...they are my favorite fall food. My very favorite fall food is a heavenly Butternut Squash soup. A kind neighbor brought it to me last year after I had my 2nd child. It was so creamy, a little spicy, and oh, so good. I have made it several times since then. We now are growing the butternut squash in our garden, and I am craving this soup right now and can't wait til I can make it. I will share the recipe on my blog one day. Thanks for the give away! You are a famous blogger Prudy! I look forward to reading every day. That's easy- anything with pumpkin or butternut squash in it. Heaven. Apple crisp!! I LOVE apple crisp!! Hands down soup. I love soup anytime but fall seems like the time of year when it becomes acceptable to actually begin making and eating it again. I am looking forward to trying your roasted pepper soup and a few more this fall!!!!!! My favorite fall food is this really tasty pumpkin, sweet potato, curry soup! So yummy! Yummy chilli on those first cool evenings. Even my family commented that they were looking forward to chilli weather!!!!! Anything pumpkin! I swear I should turn orange this time of year for all of the pumpkin that I consume. Pumpkin cookies, pumpkin bread, pumpkin pancakes, pumpkin bars, pumpkin pie, pumpkin milkshakes, pumpkin... well you get the idea. Thank you so much for your incredibly inspiring blog! I love your blog- You should know that you've changed a lot about how I shop for food, and what I cook- for the better!! I was so inspired by the modest amount that you use monthly to feed your family; and I, being 22, childless- with only a hungry boyfriend to feed- was spending only slightly less that what you spend- ridiculous, right? No more! Thanks so much- for everything. LOVE the blog! By far my favorite fall food is also our fall/Halloween tradition - donuts!! We make them from scratch invite the neighbors over and enjoy! Sometimes we include my other favorite - wassail! There are really too many favorites--but I'd have to say Pumpkin Chocolate Chip Muffins. Yum! i'm so glad you are doing this blog. i consult it way more often than my beloved cooking light for new recipes these days. Thanks for the great giveaway! And for being such a fabulous blogger! I'm crossing my fingers for the baking book :)Keep up the great work! For me, my favorite fall food is beef stew or pot roast. 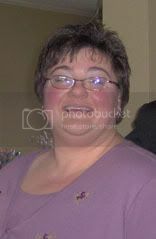 My sister-in-law is Aggie from Aggie's Kitchen and she directed me to your blog. It's great! Thanks! Soup! I love when the weather turns warm enough for soup and breadsticks/cornbread/rolls. Thats easy....Roasted Butternut Squash Soup and for dessert a good old fashioned British classic - Apple and Blackberry Crumble!! I just came upon your site yesterday. I am THRILLED about what you've been doing. Just my style!!! As for my favorite fall ingredient, I'd have to go with PUMPKIN, PUMPKIN, PUMPKIN. You can use it for anything sweet...pie, cookies, ice cream, etc. My favorite is a pumpkin trifle that I came up with a couple of years back. But, better than sweet is savory. Pumpkin stew, bisque, fun dinners cooked in a pumpkin. But again, my favorite savory dish is PUMPKIN RAVOLI with a PINE NUT BUTTER SAUCE. It's absolutely dreamy, and I can hardly wait to make it again. I love Chili for dinner and homemade apple pie for desert. How fun, I love cookbooks. My favorite fall food would have to be pumpkin spice bars with cream cheese frosting. Pork chops with sauted apples, acorn squash and gingerbread for dessert. Yum! Holy smokes Prudy! You've got yourself a deal. Slow down chicka! Favorite fall food, that Green Chili with Pork that I make... oh. So, so yummy. I don't think I can pick a favorite fall food! I jut love food, all food, too much. Hmm...I love pumpkin pie, squash, and stews. Yum! Pumpkin gingerbread. And that's all I have to say. I have a recipe for Pumpkin Turkey Chili that we all LOVE!! It is the perfect thing for when the weather starts getting cooler. I love a simple soup made with butternut squash, white beans, and spinach. It is so tasty! Soup, with fresh baked bread. Apple crisp or any baked fruit dessert warm with a little ice cream. I just started reading your blog. It is so fun and all looks so yummy. I just wish I could pull myself away to cook something. I would have to say apple crisp. What's not to love about warm apple crisp (with lots of crunchy topping), a scoop of vanilla ice cream on top, drizzled with caramel sauce. Yummy! I love cool weather food :) Such a comfort! I have many favourites, but lately I have been really enjoying squash (whatever I can get at the store, acorn butternut etc.) cut in half and roasted with brown sugar, maple syrup, butter, salt and pepper. Yummy! Wheat sesame seed bread with butter and honey--fresh from the oven, by the fire while it rains outside. i can't believe autumn is almost here. everything is moving so fast. when i think fall, i think apples, cinnamon, squash, pumpkin! so i'd have to say pumpkin pie. I love your blog~ I am definitely becoming a better cook! Fall foods.....Soup of all kinds and homemade bread...ahhh, the smell! Fall around here is also about pumpkin anything, Grandma Frei's homemade applesauce, crock pot meals, hearty dinners, desserts, cookies, and trick or treat candy! Thanks for keeping up with the blog, you wonder woman! I love it (you know that!) and share it will everyone! fall foods... i think i'm gonna go with Dinner in a Pumpkin. Seriously delish. I absolutely love your website! Thanks so much for all the yummy recipes. I actually love a crock pot beef stew for fall. It is so delicious! My favorite fall item is Any kind of soup or stew, with hot apple cider and breadsticks with apple crumble for dessert! Yum! My favorite fall food is anything with pumpkin and cream cheese frosting! Love the combination! Just wanted to tell you I left you an "I love your blog" award on my blog...I love checking out what you have cooking up. I also appreciate how you always leave comments on mine. Your awesome! That would have to be my mom's apple pie. She got the recipe from her aunt and everyone loves it. When her aunt had a piece a few years after passing the recipe on, she realized my mom had taken her apple betty recipe and added a top crust. Needless to say it is one sweet pie! Like Julie, I like just about anything pumpkin flavored! Pumpkin cookies, pumpkin pie, biscotti...oh, I could go on forever! Chili and cornbread...does life get any better??? Pecan pie and cincinnati chili! pumpkin cream cheese muffins from Starbucks - heck anything with pumpkin in it! Corn and sausage chowder is my absolute favorite. I can't wait for Florida to have a little chill and I'll be making this. I would have to say that my favorite fall food is baked apples- sweet, tart, and warm from the oven. Thank you for the chance to win a fun book! I just came by to say Hi and here you are again giving stuff away! Since I have an aversion to some falls foods and no real "fall" here this is a bit tough. I think for me it is apples and hot apple cider--yum. Also any kind of soup on a cold fall day is nice! My favorite fall food? Chili. I love it. I can hardly wait for it to get cool enough to eat it. I miss the east coast fall and experiencing fall through food is great alternative! I have trouble deciding between pumpkin ravioli with sage butter sauce and good ole pumpkin bread with cream choose spread on top. I drive home for a few hours and suddenly you have over a hundred comments! I love reading them and your blog too. Well, I love the entire Family Fall cookbook that you so lovingly gave us a few years ago. Favorites.....??? I love your corn chowder, pumpkin chocolate chip bread, chili, Pumpkin spice doughnuts, and the brown bag 2 hour apple pie. Must I stop? I'm with Gigi;everything tastes better in the cool weather of Autumn. I can already hear the extra pounds knocking at my door :). We miss you already Prudy, Quiet Man, and two darling charges! definitely pumpkin pie and gingersnaps!! Thanks for having this giveaway Prudy! Oooh! I could so use that slow cooker book! I work 40-50 hours a week and the hubby's in law school full time, so I could realllly use it ;)! Ok, I'll stop begging. oh darn, I got so caught up talking about the cookbook that I forgot to mention my favorite fall food :D! I have so many, but I love all the seasonal veggies! Especially soups and stews. I love fall! My favorite would have to be sweet potato casserole with a crunchy topping. Thanks for having this great giveaway. My favorite fall dish is anything with apples! Mostly, gooey caramel apples and homemade warm applesauce. I think autumn is officially here when I see plump POM pomegranates in the store. Yum! I love them plain, in salads, and in a time-consuming yet totally delicious pomegranate jelly. Thanks Prudy for making cooking fun, delicious and healthy! I check your blog first thing every morning--even before CNN and Facebook. My favorite fall food is apple crisp. MMMmmmmm...and so easy. Butternut squash, cubed and tossed with olive oil then baked. Right before service toss with a bit of pesto. It is the best! pumpkin cheesecake, hands down. the one with the pecan/ginger snap crust. Delish! As soon as the weather cools a bit, I get a hankerin' for some yummy pumpkin chocolate chip cookies. I just can't eat them in the summertime. It doesn't go with the heat. pumpkin bread- nothing says Fall like pumpkin and all of those wonderful aromatic spices! I love apples in the fall! A warm apple crisp with a yummy brown sugar and oat crumb topping and a scoop of vanilla ice cream all melty on top. That is my idea of the perfect all treat! butternut squash. particularly as the filling for a ravioli or the predominant flavor in a risotto, etc. My favorite fall food is pumpkin pie. I have a recipe that uses lots of spices, mmmm creamy and sweet. Oh oh I think I drooled a bit. Oh Prudy you are so generous! Let's see, Candy Apples just really put me in the Fall spirit! favorite fall food - especially on a chilly saturday with a football game - home made chili with fresh hot bread. i could eat it every week. My absolute favourite fall food is apple crisp made with apples that we pick up from the orchards that surround us. With some custard (for Todd) and Ice cream for me, there is no finer dish on earth! My all-time favourite autumn food is a Romanian dish called sarmale. So glad you love it, because we love you! And I won't make you pay International, I'll just pick it up next time I'm home. My favourite fall-time dish would be a stew (probably with beef or lamb) topped wiht homemade potatoemash and gruyere, for dessert apfelstrudle wtih warm vanilla sauce.. Jumm!! I love fall...I think my favorite would be apple turnovers or Waldorf salad. My favorite fall meal is roasted pork tenderlion with mustard white wine sauce, we eat it at least twice a month in the fall. As far as dessert goes, it's pumpkin roll and carmel apples! how gracious of you to offer such a cool give away- fall is a fond time for me, the crisp air and all the food tidings. My favorite fall food is pumpkin (Japanese pumpkin- I think it looks like a green pumpkin- squash)? Anything with pumpkin makes me very excited for fall. I think my two favorites are pumpkin bread and my pumpkin chocolate tart. Pumpkin Cream Cheese Swirl Coffee Cake! Mine would have to be dessert *grin* with my sweet tooth and an apple ^ cinnamon dessert cake served with lashings of custard is my ideal heaven in the fall. I absolutely love fall! Even more than fall I love fall foods. I love my Mom's creamy chicken noodle soup with warm homemade rolls. I am absolutely in love with pumpkin too and I love Neilsens Pumpkin frozen custard. Absolutely to die for! I love boiled dinner ! I also love dressing and gravy ! Let's not forget pumpkin bread! My fave Fall Food would have to be a pot roast, slow cooked in my CrockPot all day long with TONS of veggies - onions, celery, potatoes, and carrots. There's nothing like walking in the door after a long day at work and smelling the delicious aroma...especially when the air outside is just starting to get crisp and cool! When I feel fall in the air - Pumpkin pie is what I want on my plate and maybe a cup of Butternut squash soup! Yeah Fall!!! Hey Prudence- I'm a new reader and I am loving your blog! apple pies from apple hill! too yummy! love your blog and all your incredible recipes! Pumpkin anything!! I love pumpkin! My mom's hot cheese soup on Halloween. It's hard to pick just one, but I love some Pumpkin Soup! Love all your great tips and recipes. Please keep them coming! My favorite is apple dumplings. Yum! Although I don't indulge in these very often, I would have to say any kind of pie--pumpkin, apple, blueberry, banana cream--I LOVE pie! My kitchen could use all of these books but with a baby #4 on the way soon...the slow cooker one has caught my eye. Fall foods? SOUP! Any soup. Last night I had (at a restaurant) Tomato and Basil with goat cheese! YUM! Soup and anything pumpkin. Yum! Thanks for the chance to enter. favorite fall food...would have to be soup. Chunky, hearty veggie soup with warm crusty bread. Mmmmm. for fall, i do a lot of baking with peaches and apples. last night i made peach cobbler with maraschino cherries and it was a hit with everyone! My mother's Wild rice chicken soup and her homemade pop overs.....yummy!! I love autumn because I love soups and chili. And we also bake a lot with the apples and peaches that we have picked. And don't get me started on Thanksgiving....my absolute favorite holiday! There is almost always something cooking in my crockpot but new recipes would be most welcome. Thanks for the chance to win your great giveaway! I love pumpkin chocolate chip anything. I think it is the perfect treat that just tastes like fall. SOUP! I love any kind of soup in the fall. Put some homemade breadsticks or rolls with it and it's the perfect fall food!